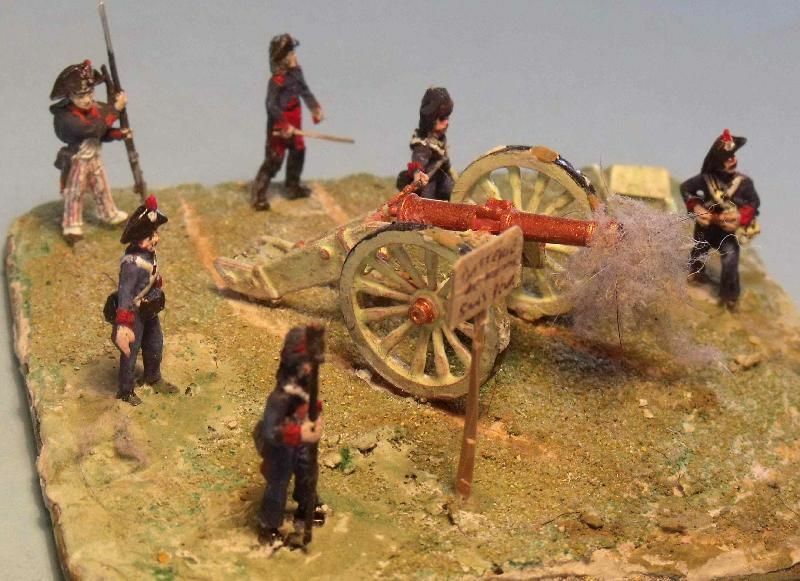 Please find attached some photographs of 1805 French Artillery test shots (set 8229) painted and converted to represent the 'Batterie des hommes sans peur', from the Battle of Toulon. Head swaps have been made from the French Field Forge set 8107, with milliput added to modify the bonnet de police. 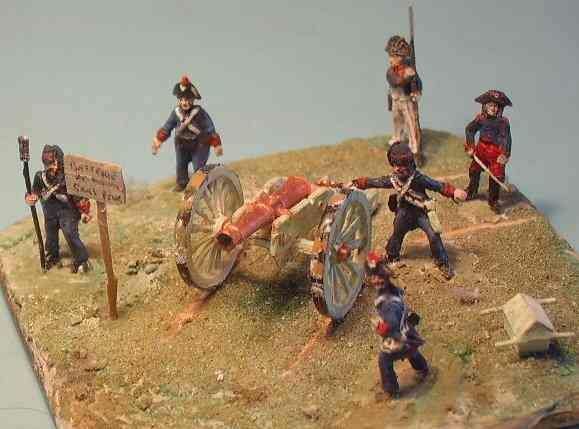 The body of the young Napoleon also comes from the 8107 set with a modified head from the 8229 set and, after some carving off of surplus plastic, Milliput was used for the coat tails and detailing. 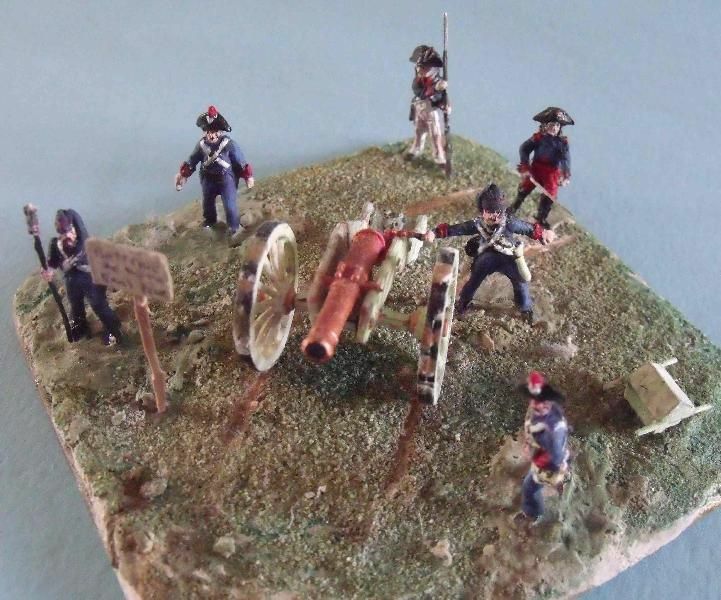 The Infantryman is from the set 1805 French line Infantry of 1805. 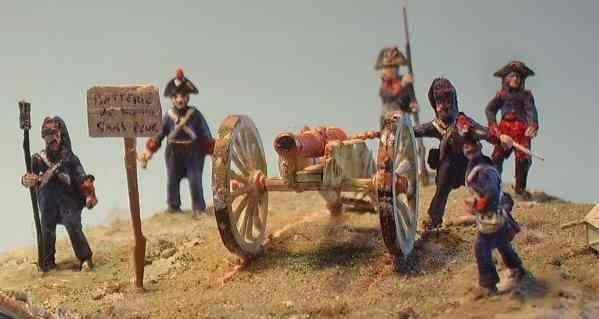 The cannon should be assembled before painting and I found that Acrylic paints are best for painting these figures. However, some fine detail and especially white items were easier to paint with enamels. ( n.b. Some enamels take a long time to dry) The base was made from Dri-Wall Adhesive plaster applied to a coaster. The figures' bases were pushed into the wet plaster and the surface was shaped for affect. When dry, the base was tidied up and a coating of PVA was brushed on and then very fine sand was sprinkled over it. After a few hours it was gently brushed to remove loose sand and then painted with different colour Acrylic paints to give the effect of soil and grass. The sign post was made of plastic and card.